Since we are on experiment discussion below again, here is one I have been paper trading. A twist on #pietrades. If we need a new term we could call them #lizardpies. So obviously with the market rout all my #pietrades went ITM and to prevent a meltdown in margin I converted them all to #fuzzy. Which is great, has controlled the volatility and still have 111 weeks to manage them. But as @fuzzballl points out below, they are expensive. Cheaper than stock but my EXPE puts are now trading at 22.40 and 19.50. Not chump change. The #pietrade idea is sound for income generation and even some capital gains long term as long as you sell the call ATM or OTM once assigned the stock. You also are typically only selling 1 side and as Karen the supertrader (now scam artist) figured out, selling the other side is what really improves long term returns and consistency. She may have been using some creative accounting but the idea is sound and has been proven by tasty trade. So here is the tweak I have been playing with. When you set up the trade, start it as a #jadelizard but set it up ATM. For example with XBI currently at 78.02 I would sell the 10 DTE 78 puts naked (cash secure) and then sell the 78/79 call credit spread. Total credit 2.55. No upside risk, downside break even is 75.55 which is lower than where I probably would have just sold the put. 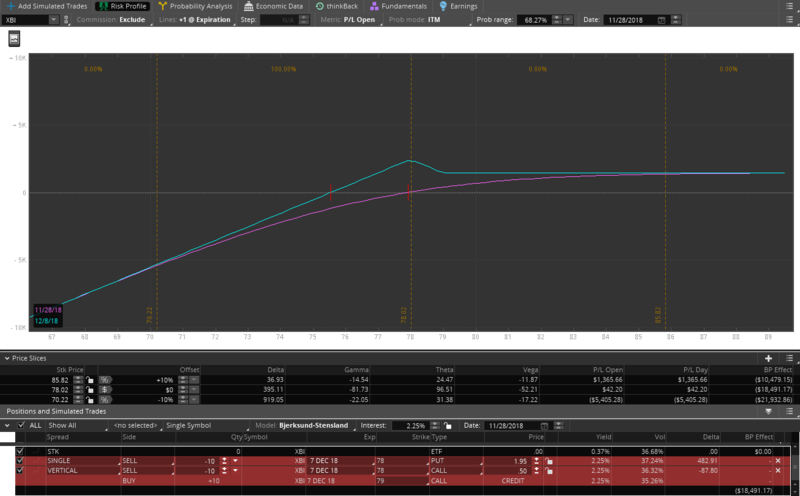 b: Between the strikes max profit and you may be assigned on the call but can exercise your long call if needed. c: above 79 everything cancels out and you keep the credit minus $1. Here’s a graph on a 10 lot. I have been trading it on paper and it would have had better loss control on the #pietrades than straight put sales the last 2 months. Thoughts, holes in the strategy, other ideas to tweak it or make it better? If you wanted to be more conservative could sell strangles OTM instead or straddles ATM on the short sides but then less credit. Since my premise is income, I am trying to bring in as much credit as possible on the front end. #Earnings Sold to Open $CRM Nov 30th 113/118/138/143 condors for 1.09. Leans slightly bullish. I’ve got a couple experiments going on that are kind of interesting. They came out of long term positions where the weekly calls got run over. I booked the LEAP calls for gains and then rolled the run over weekly calls into bull put spreads and continued selling against them. For instance let’s look at WYNN. A stock that’s pulled back a lot with great weekly premium. How about selling a Jan 2021 ITM 140/110 bull put spread for 18 bucks. 30 wide for 18 bucks so the max risk is 12 dollars. Sell weekly calls against the spread for the next two years only needing to cover the 12 dollars to have a risk off trade. What could happen long term? 2. Stock tanks but you easily cover the risk with weekly sales. 3. A combination of both where selling just 50 cents a week makes 44 dollars profit at the end no matter where the ITM spread ends up. I think I like these since they can be done without any cash outlay and the minimum required to cover the risk is considerably less (Jan 2021 LEAP calls are 25 dollars so over twice the risk of the ITM spread). Profit is “sort of” capped but that’s ok. The real money is in the weekly sales anyway. #SPXcampaign Sold $SPX Nov 28th 2590/2610-2710/2730 condors for 1.15. Expires tomorrow. #earnings #shortstrangles CRM Sold Dec…. Sold Dec. 21, 105/145 for 1.73, thanks again Jeff.